Future Samsung 8K TVs will be completely bezel-less | What Hi-Fi? Samsung has today announced a new 8K display driver that it says will allow for slimmer, bezel-less 8K TVs in 65in+ sizes. That’s thanks to the display driver IC (DDI)’s increased data transfer capability – allegedly it allows for data transfer speeds up to 4Gbps, double the current capability – which increases a display’s efficiency in transferring the massive amounts of image data carried in 8K resolutions. That, in turn, reduces the need for additional components around the display to do the job, allowing Samsung to slim down its TV designs. 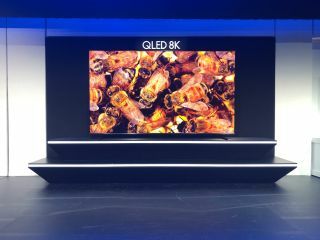 Samsung's current 8K QLED TVs, such as the QE85Q900R (85in) and QE65Q900R (65in), have thin bezels along the top and sides, with a thicker lip of about 2-3cm at the bottom. While they're hardly an eyesore, invariably a bezel-less design would be easy to get onboard with. Samsung is adamant that this updated interface (name: USI-T 2.0) is crucial for 8K TVs. “To deliver true 8K resolution, it is essential for today’s DDIs to support a high-speed 4Gbps intra-panel interface,” said senior vice president of System LSI marketing at Samsung Ben K. Hur. The updated interface also supports a smart EQ feature that Samsung says will reduce the possibility of bit errors, and thus increase the consistency, in panel production. 8K vs 4K TV review – which is better?